CLICK ON PAST NEWS TO SEE NEWS STORIES STARTING FROM 2017. 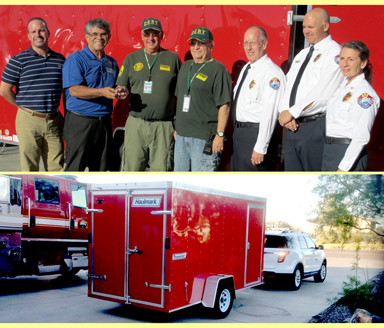 NEW CERT TRAILER – During the October 11, 2016 CERT (Community Emergency Response Team) meeting, Oracle CERTs were presented with a new trailer. The trailer including rescue equipment inside, was donated by Pinal County Emergency Management 's Director Chuck Kmet. Pinal County Board of Supervisor Pete Rios spoke about the high praise he had for our very special and important community volunteers. BRUSH BURN DECEMBER 2016 – OFD firefighters didn't waste any time getting the burn brush going at the Oracle Firewise Brush Disposal Site. Weather conditions this week were ideal for burning. After a one day closure (to assure complete extinguishment) the brush dump reopened on Dec. 28. You can also RECYCLE THOSE CHRISTMAS TREES – stop by the ofd office to get the key to the brush dump. it is free. SANTA WAS HERE! – Santa passed through Oracle on Dec 9, 2016 to check on the kids. Santa's visit started at Mt. Vista school via helicopter generously provided by LifeNet. He then toured around Oracle and settled into an evening of fun, refreshments, and even a jumping castle which the Rite of Passage crew helped supervise. Over one hundred children told Santa their Christmas wishes and left with a stocking full of goodies. Ho Ho Ho, Merry Christmas! VIPER GETS THE HOLIDAY SPIRIT! – Thanks to Karen Lombardi, who always does such a phenomenal job of organizing people for decorating the Viper and its 185-lb dummy. There was no shortage of Christmas elves this year! Big thank yous to Margie, who helped Karen sort through the decorations and organize them into boxes. And to Mary, Brian, Kevin, Bernie, Robbie, and Kate, for braving the morning chill and helping with the hands-on decorating. Another thank you to the on-duty crew for driving the Viper to a warmer spot for decorating, and especially to our front office elf, Lilliana, who made coffee, hot chocolate, some little goodies, and more importantly, provided her bright smile to cheer even the coldest days away! FIREFIGHTER NEWS! – Oracle Fire District Engine Boss Rocky Ortiz explains the severity of the fires that he and fellow Oracle firefighter Captain Paul Farrell have encountered while assisting in the firefighting efforts taking place near Boone, North Carolina. Oracle Fire District is happy to be able to help out on the other side of the country and very proud of our firefighters! Click HERE or on the image below to see the interview featuring Rocky and his assessment of the fire area. vehicle stabilization & patient extrication, extinguishing a vehicle fire, search and rescue, multiple patient triage with emergency scene treatment, patient packaging for transport and a high angle rescue. Photos by Collins Cochran. Click on the group photo for a larger version. All together more than 80 emergency responders and another 20 auxiliary volunteers participated in the all day exercise. The full story can be found in the Sept. 21st edition of the San Manual Miner. 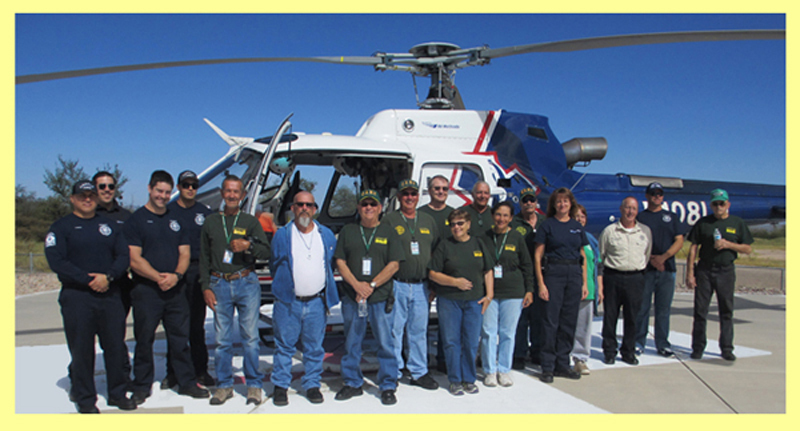 Lifenet EMS HELICOPTER TRAINING, Sept. 24, 2016 – Lifenet 2, an EMS helicopter from Air Methods Corp., provided Oracle Firefighters, Oracle CERTs, EMTs and Paramedics with a three-hour training class. Training instructor Joy primarily focused the classroom presentation on safety and communication while working around EMS helicopters. She also taught about various things to consider when selecting a temporary landing zone site and how to provide accurate ground condition information such as wind speed, wind direction, vertical obstacles along with overhead wires and other important information to the helicopter pilot. 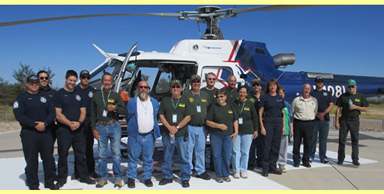 Once the classroom presentation was completed, the helicopter landed in the OFD Helicopter LZ (near Oracle Courthouse) and the flight crew provided additional safety and other information to everyone in attendance. Click on the photo for a larger version. 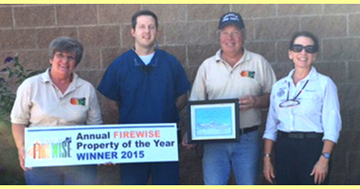 FIREWISE PROPERTY AWARDS FOR 2016 – The Firewise Board awarded the annual Firewise Property Awards for 2016 at the CERT meeting on August 9, 2016. These private or commercial properties met or exceeded the national fire safety code and made a tremendous difference in what was there before. The private property award went to Lou and Dee Moore. The commercial award went to the Visitor's Center with Alicia Bristow accepting. Watch for signs that are placed in front of the properties. Remember, you too can firewise your property by cutting down all high grass, removing dead shrubbery and leaves, and making a perimeter around your property to prevent the spread of fire. Our brush dump is open to Oracle residents every day of the week. Stop by the fire station for details. Dec. 28 from 9am-3pm. For more information call 520-431-5663. SANTA'S COMING! – Santa will be in Oracle on Friday, Dec. 9, 2016. He will land at Mt. Vista School around 2pm via Life-Net helicopter and will spend a short time waving and inviting kids (and adults if they wish) to visit Oracle Fire Station at 4:30pm. Santa will also take a trip through Oracle so the community can see him around 3pm. He will be escorted by the duty crew and dropped off in time for kids waiting at the station. ORACLE FIRE BOARD UPDATE – Manny Navarro is stepping down this month from the Oracle Fire Board as his term ends. He was given a plaque at the last Oracle Fire Board meeting on Nov. 8, 2016. We would like to thank Manny for his service to the fire district and to the community. Taking his place next month is Dale Suter. More information next month on the transition. Shown below is Fire Chief Larry Southard, Manny Navarro and Assistant Fire Chief Robert Jennings. • Oracle Fire District Firewise Co-Chair Mary Harris - Explanation of the Emergency Notification System, how to sign up and offer of materials on how to create a Firewise home. Click HERE if you would like to view the article on this meeting that was in the Miner. If you would like to view this meeting in its entirety on YouTube, please click HERE. The entire video is an one hour 20min long. 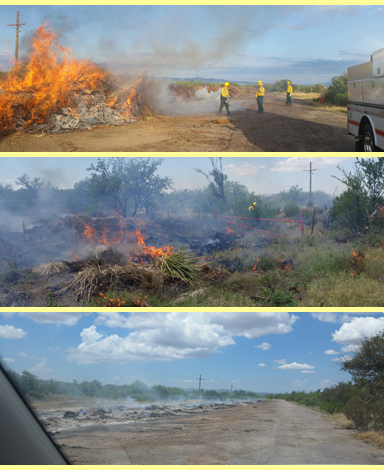 BRUSH BURN JULY 2016 – After the long awaited arrival of the 2016 monsoon, OFD firefighters didn't waste any time getting prepared to burn brush at the Oracle Firewise Brush Disposal Site. Approximately 1,100 loads of brush had accumulated since the last brush burn was held on March 15. The unburned brush pile had reached approximately 1000 feet long by 20 to 30 feet deep and 6 to 8 feet tall. Weather conditions on July 20 were ideal for burning and all burning objectives were met, including firefighter training objectives. After a one day closure (to assure complete extinguishment) the brush dump will reopen on July 21. ORACLE SPAY & NEUTER CLINIC – On July 9, 2016 Charlottes Way Rescue hosted this clinic at the Oracle Fire station. It has been reported as a success due to all the many people behind the lines, both professional and volunteers. More than 100 animals were spayed or nuetered lessening the risk of strays or unwanted animals being euthanized. A big thank you to Cher of Charlottes Way Rescue for getting this together. What is a Red Flag Warning? – According to the National Weather Service, a Red Flag Warning is issued when a "combination of low humidity, strong winds, dry ground cover, and warm temperatures are expected to bring critical fire weather conditions to the warned area." Please note that we put our "Red Flag" out in front of the station whenever this condition is present. We have had several days of wind. Let's hope it settles down. 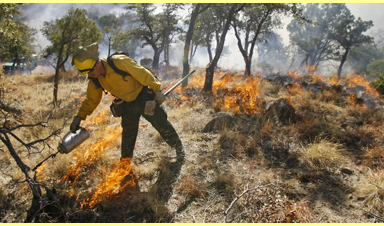 CATALINA-RINCON FIRESCAPE PROJECT –The Santa Catalina Ranger District, Coronado National Forest was seeking comments during a 30-day comment period on a draft Environmental Assessment (EA) for the Catalina-Rincon FireScape Project (CRFS). The CRFS is a landscape-scale restoration project that focuses on promoting resilient ecosystems; protecting life, property, and natural resources; and encouraging natural wildland fire to function as a healthy process in the ecosystem. Oracle Firewise Board decided to send a letter on their position for this Project. The letter can be viewed HERE. Here is a link to Coronado National Forest's home page if you wish to follow up on this project. If you need more information on Firescape, click HERE. Contact Christina Pearson (520) 760-2315 or SantaCatalinaRD@fs.fed.us. Arizona Dept. 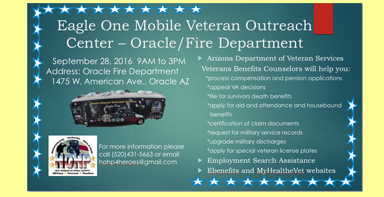 of Veteran Services will be at Oracle Fire on Sept. 28 from 9am-3pm. For more information call 520-431-5663. SEPTEMBER 11, 2016 – Fifteen years ago Sunday, the United States changed forever when four airliners crashed into the Twin Towers in New York City, the Pentagon in Washington, D.C., and a field outside Shanksville, Pennsylvania. The men and women who died in the attacks are being remembered this weekend with parades and memorials throughout the country. Special services will be held at the spots where the planes crashed. Oracle Fire District expresses their condolences to all those who lost their lives and honors the heroes that became such a big part of the aftermath. Along with OFD staff the Firewise Board worked hard to make it a successful day for all. CONGRATULATIONS – to Oracle Fire's Captain Paul Farrell. Captain Farrell recently graduated from Pima Community College with an Associates degree in Fire Science, all while juggling his full time job, part-time work, and raising his two sons, Patrick and David with his beautiful wife, Martha. We're proud of you, Paul!! A GREAT SAVE – Oracle Fighter Rocky Ortiz (center) along with brother Zachary (left) and RN Rebecca (right) were off-duty from their career jobs and each were busy working out at a health and fitness gym in December 2015, when George (at podium) collapsed while exercising on a treadmill. After moving George to a clear area, Rocky quickly began performing CPR while Zach went to find an AED unit. The three lifesaving heroes were recognized in Phoenix on June 10th by Arizona Emergency Medical Services (AEMS). Each were presented with a Heart to Heart Award. Approximately 300 people attended the event. CPR along with defibrillation can provide one of the best chances of survival for victims of sudden cardiac arrest. Fortunately for George, a well trained group of total strangers knew exactly what to do and they quickly and efficiently put their training and skills to work. George was transported to a nearby hospital emergency room, and what could have been a very tragic event, ended up having a happy ending. George and his lifesaving group are no longer strangers and a new friendship has been formed. Meeting George along with his wife, and seeing the tremendous gratitude they both have toward Rocky, Zachary and Rebecca was a very heartwarming experience. GRASS FIRE IN ORACLE – On Friday mid afternoon (5/20/16) we had a grass fire. The fire near Maraposa and Robles was about an acre in size and was extinguished in eight minutes by our capable crew. Thanks guys! Folks, don't delay – get your yards cleaned up! Use the Brush Dump and be prepared! To Take: Family / Pets /Legal Documents / Money / Medications / Jewelry / Sentimental Items / Food and Water / Toiletries / Clothing / First Aid Kit / 72-Hour Kit / Emergency Contact List / Cell Phone connections. NEW ENGINEER – Joel Manspeaker has been promoted to the rank of Engineer at Oracle Fire District. Joel's wife Liz is pinning his new badge while his daughter looks on. NEW FIREFIGHTER – Firefighter Rocky Ortiz received his badge during the Oracle Fire Board meeting on Feb 10, 2016. Fire Chief Larry Southard, Assist Chief Robert Jennings and Admin Chief Tina Acosta were honored to present Rocky with his badge and to welcome him to the fire department as our newest full time firefighter. Rocky Ortiz is shown below being pinned by his wife Erin. ORACLE FIRE DISTRICT CELEBRATED ITS 50th ON SATURDAY, APRIL 30, 2016 . . . THANKS FOR ATTENDING! • Free give-aways while supplies last. Great fun! We are looking forward to sharing our history with you, as well as celebrating the continuing vision of our work, training and service. EARLY FIRE POTENTIAL – Oracle Fire E692 responded to a brush fire on 2/18/16 on hwy 77 between mm105 and 106. And there was another one today (2/23/16) that was put out quickly. So it is mid-February and already fire season! Let's get our yards cleaned up early and use the Brush Dump – open every day! Please do not throw out cigarettes or allow chains to drag while pulling a trailer. 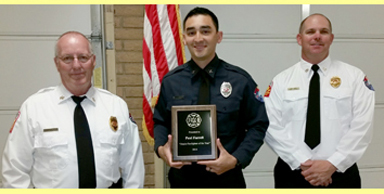 FIREFIGHTER OF THE YEAR – Michael Parra has been selected as the Oracle Firefighter of the Year. Michael was awarded his certificate during the annual Elk's Lodge Appreciation Dinner event held in San Manual on January 30, 2016. Members of Michael's family were present to watch him receive this special recognition. OLD VIPER DOES GOOD! – Our old Engine 1 viper is back in service. It has been moved for now from the fire house. We enjoyed seeing it decorated for the holidays. 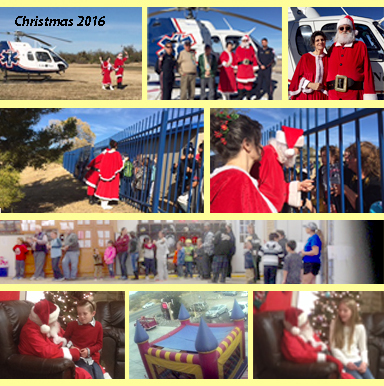 SANTA DROPS BY – Santa and Mrs. Claus arrived at Mountain Vista School by helicopter where Santa greeted several hundred anxiously awaiting school kids on Friday, Dec 11, 2015. 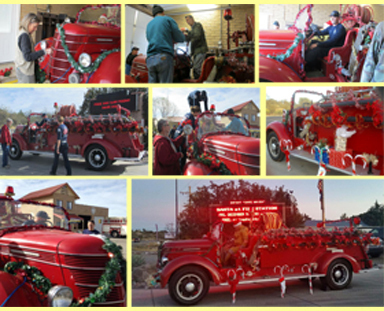 Oracle Fire District offered a ride through the community in their recently-restored 1940 International Viper. Santa then arrived at the fire station to a line of kids, waiting to tell Santa about how good they have been. Waiting was fun, as hot chocolate and cookies were provided through donations, and there was a Santa letter writing and coloring station for entertainment. At least 100 kids got to sit on Santa's lap and received a stocking filled with goodies by his loving elves. It was a great evening for all! 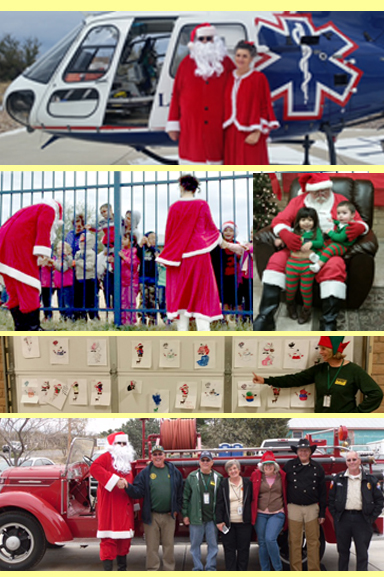 The Oracle Fire District staff, firefighters, and volunteers wish you all a safe and very merry Christmas!! Oracle Fire District offered a ride through the community in their recently-restored 1940 International Viper. BRUSH BURN DECEMBER 2015 – The Brush Dump was closed on Dec. 8th for burning. An estimated 1200 loads of brush had been collected and piled at the Brush Dump since the first week of July when the brush was last burned. Shown in the picture is Firefighter Michael Parra igniting one side of the 1000 foot long pile with a drip torch. Firefighter Joel Manspeaker is doing the same on the other side. The burn was supervised by Captain Tyler McGovern. EARLY THANKSGIVING – On Nov 18, 2015 the Florence Wildland Team was treated to a traditional Thanksgiving dinner at the fire station. The dinner was provided and cooked by Oracle CERT and Oracle Firewise members. The annual dinner event is a special thanks for the wildland firefighters who have helped make our community safer by thinning out heavy vegetated areas and making defensible spaces for local Oracle residents. The day began with a hike along the south side of Oracle and the wildland crew learned where the access gates into Coronado National Forest are located. Several possible lookout points and safety zones were also identified. Upon returning to the fire station a sand box that we use for training, had been set up to mimic the area where the crew had just hiked. Several scenarios were played out on the table and the crew including the OFD on-duty crew practiced fighting a variety of imaginary wildfires. On Saturday October 17th, Oracle Firefighters and Oracle CERTs combined for a training exercise that was held at the Oracle Courthouse. During a large disaster, CERTs can be requested by firefighters to assist with emergency operations. An important role that CERTs provide is by setting up a place for firefighters to rest, cool off and re-hydrate. The scenario for this drill was to respond to a simulated structure fire, with their CERT trailer and to set up a re-hab station, along with the firefighters doing what they do best...a fast attack on a fire. At promptly 1300 hours CERTs were dispatched via text message and they responded to the fire station from their homes. Within several minutes a dozen or more CERTs had arrived, divided into teams and selected team leaders. Transportation decisions were made, the CERT trailer was deployed and a quick...but safe response was made to the courthouse. Once the CERTs had set up; the on-duty crew was dispatched to begin suppression operations. Several minutes later a firefighter simulated a fatigue condition and went to the ground. Firefighters assisted their fallen team member to the CERT re-hab station where CERTs began by removing his SCBA equipment including his turnout clothing, while also monitoring his vital signs and re hydrating him. All objectives for the exercise were met and although we hope something like this never occurs, we take comfort in knowing that we have such a talented and well trained auxiliary team to assist us when we need it most. CERTs and OFD/ firefighter staff that took place in the drill shown below are: (back row): Peter Van Keuren, Dan Piermarini, Cathleen Piermarini, Collins Cochran, Suzie Fairbanks, Kevin Armbrust, and Assist. Fire Chief Robert Jennings, (front row): Doug Johnson, Rachel Opinksy, David Harris, Susie Cochran, Kate Horton, Barbara Haas, Kevin Armbrust, Brian Kirkpatrick, and Fire Chief Larry Southard. On top of the fire truck are firefighters Thomas "Bubba" Mathews and Michael Parra. Also taking part in the drill were: Admin. Chief Tina Acosta. Throughout the year, we find that some places and owners really outdo themselves with the firewise mission. Here are our two winners for 2015. Congratulations goes to John and Karen Medley for winning the 2015 Firewise Private Property award. They are shown here with Firewise Board Co-chairperson Mary Harris and Fire Chief Larry Southard receiving their award. The Business/ Public award goes to Bradley O. Kaiser, DMD PLLC for his dentist office property on American Avenue in Oracle. THIRD GRADERS VISIT OFD – (Sept 2015) Oracle firefighters Thomas Mathews and David Selby visited Mrs Dedrick's 3rd grade class to talk about what firefighters do for their communities and how they help neighboring communities during large emergencies. The students are learning about the September 11th, 2001 World Trade Center disaster. The presentation by Thomas and David was mainly about how firefighters help rescue people in need. Thomas talked about his recent trip to California where he worked on a large wildfire and David suited up in his turnout gear and crawled through the darkness while the students hid in various places within the classroom. Once the students found they could not hide from the Thermal Imagining Camera (TIC), they were given turns using the TIC to view their classmates. Shown in the picture is Mrs. Dedrick using the camera; once the lights had been turned off, she could easily view all of her students. SHRED-A-THON IN ORACLE (Oct 24, 2015) – The 2015 Shred-a-thon is over. We thank you for your participation . . .
We had approximately 35 vehicles who filled half a truck with materials to be shredded. We collected approximately four large boxes of food and $102 for the Tri-City Community Food Bank. There were eight members of the Firewise Board and CERT team. Also attending were Cody Wilkinson, the manager of Canyon Community Bank of Catalina and two employees of Beacon Secure Shredding company that set up the event and participated from 10am until noon on Sat, Oct 24th. Several people asked if we would schedule another shredding event and it's a possibility that in six months or year we will do that. Let us know if you are interested! THEY'RE BACK . . . Oracle had two new messages on the ofd marquee this week welcoming home the firefighters that went to California to help with the fires. Thanks also for the sacrifice of the families who were without them for a month. And, we can't forget our at-home firefighter crews who are always there to help, care and lend their assistance to those in need in our own area! OFD ON DEPLOYMENT – Oracle Engine 692 was deployed to assist with the Mad River Complex Fire in Northern California.The Mad River Complex Fire began on July 30th, and is a series of seven lightning caused fires from a storm that moved through a mountainous region located between Redding CA and the Pacific Ocean. Currently 1,165 personnel are assigned to the 20,525 acre fire and the time of this writing it is estimated to be at 40% containment. The four-man crew is on a typical 14-day assignment through our contract with the State of Arizona. Shown above is Captain Paul Farrell of Oracle Fire District and Firefighter John Aguiar of Golder Ranch Fire District conducting "Burnout Operations" at the Mad River Complex Fire in Northern California. Not pictured are OFD Engineer Thomas "Bubba" Mathews and GRFD Engineer Rob Russo. NEW FIRE DISTRICT BOARD MEMBER – On August 12, 2015 the newest member of the Oracle District Fire Board, Franky Hill was sworn in by Board Chairman Ellie Brown. Bill McMurry, and Bud Bristow. EVER FORGET OUR WEBSITE URL NAME? Not to fret now. Did you notice? We have new reflective signs at both entrances to Oracle including before the post office where the Fire Status sign is located. Let us know if they show up at night. WILDFIRES BLAMED ON CLIMATE CHANGE, MORE FLAMES, HIGHER COSTS – A new online article on CNN investigates this topic. Click HERE to read this article. PROMOTIONS AND BADGES . . .
Thomas "Bubba" Mathews has been promoted to the rank of Engineer. Shown below is Bubba's fiancé Lina pinning on his new badge. Joel Manspeaker has received his Firefighter badge. Joel was hired as a full time firefighter in April 2015. 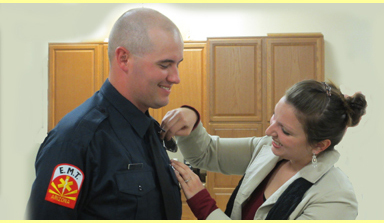 Shown below is Joel's wife Liz pinning on his new badge. BRUSH BURN – Photos from Monday's Brush Burn . . .
Oracle firefighters ignite the beginning of a 1000 foot long pile of densely compacted brush. The brush is brought to the Oracle Firewise Brush Dump every day by local citizens after trimming their trees and clearing their yards of flammable vegetation materials. While waiting for the brush pile to burn, firefighters practice "Burn-out Operations" by using drip torches. Items of value were identified such as trees and power poles, and after firefighters cleared a small area surrounding them, a larger circular shaped area was burned out ahead of the advancing fire. The advancing larger fire burned around the prepared area much like what happens during a real wildfire when a home has a defensible space. Fire Chief Southard estimates this burn was approximately 1400 loads of brush that would otherwise be hazardous wildfire fuel in peoples yards and around their homes. The brush burn was a success, the weather was perfect for burning and all objectives were met. TIMBERLINE FIRE – On May 26th, Engine 691 responded to a report of a vehicle fire on Timberline Drive. Upon arrival, an RV pickup/ camper was fully involved in flames. Firefighters quickly extinguished the fire. At this time, the cause of the fire is unknown. No injuries were reported and no other property was damaged. ARCING WIRES IN ORACLE – Near the end of a Century plants life cycle, it will grow a large stem from the center that can reach heights of 20 to 30 feet. The one shown in the picture is a typical plant, however it just happened to grow directly underneath of a high voltage power line. As the stem got within an inch or so of the power line it developed an electrical arc that could be seen and heard for quite a distance. Engine 692 responded to a 911 call for "Arcing Wires" and remained on scene until the electrical company could safely saw the stem away from the power line. What is a Red Flag Warning? – According to the National Weather Service, a Red Flag Warning is issued when a "combination of low humidity, strong winds, dry ground cover, and warm temperatures are expected to bring critical fire weather conditions to the warned area." • One Load:	$3.00 • Two Loads: (truckbed plus trailer)	$5.00 • Commercial-size load: (dump truck)	$10.00. plastics, metal, fluids and site cleaning material. We are open all day, every day! 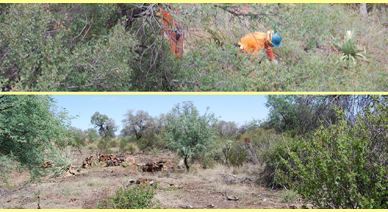 MASTICATION MACHINE – The Arizona Department of Forestry worked on a brush-thinning project along the west end of Oracle. The 3-mile long project was partially completed by hand crews using chain saws and then placed the cut materials into piles. Those piles were shredded by a mastication machine as shown in these pictures. The mastication machine will be used in places where getting the chipper close enough to the cut material is not feasible. Several upcoming projects will be completed in this same way. PROPERTY EVALUATION MAPS – Property evaluations by members of the Fire Dept. and the Firewise board have been conducted. Final results are not posted yet, but we will inform you when they are. In the meantime, if you would like to see the present map to see how your property was doing in 2009, click HERE to go DIRECTLY to that page. The Prescription Drop Box is no longer at the Oracle Fire Sation. The closest dropoff station is at: San Manuel Substation, 28380 S. Veterans Memorial Blvd., San Manuel, AZ. FINGER ROCK FIRE – A brush fire in the Catalina Mountains, which was started by a lightning strike on July 29. Despite fewer flames and less smoke seen Thursday morning, the Finger Rock Fire has grown to 750 acres. Thursday morning, higher humidity and cloud cover help slow down the growth of the blaze. For many spectators, the eerie glow acts as a reminder of the Aspen Fire from 2003. In that blaze, 85,000 acres were burned, including Summerhaven. Unlike the Aspen Fire, no structures are in danger in the Finger Rock Fire. The flames worked away from the Catalina Foothills into steep and inaccessible rocky terrain, unsafe for firefighters. The U.S. Forest Service has decided not to battle the blaze head on. The Forest Service said the flames will revitalize this part of the Coronado National Forest, which has not been burned in nearly 80 years. According to the National Forest Service, the fire started on July 29 by lighting and was reignited for the second time on Wednesday. Forest Service officials have a crew on scene and are monitoring the fire's movement. 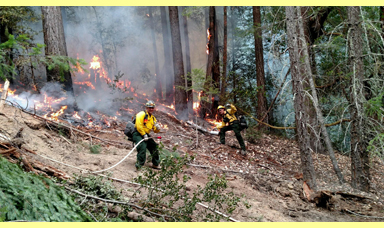 For more information about how the forest service handles wildfires, click HERE. 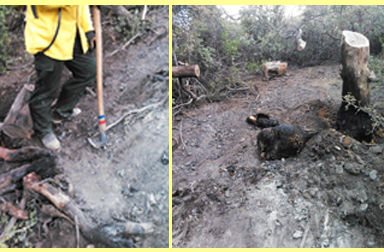 BRUSH BURN – The brush burn yesterday was a success and we now have a clean slate to work from. We burned out two grassy areas just east of the brush dump gate and the grass would not carry a flame without adding Drip Torch fuel. VERY good news!!!! FIREFIGHTER OF THE YEAR – Captain Paul Farrell was presented with the Oracle Firefighter of the Year award during the May Fire Board meeting. Captain Farrell has been employed as a full time firefighter for the past seven years and this is the second time he has received our highest award. Paul's wife and children were in the audience to watch Chief Southard and Chief Jennings present him with a plaque. ORACLE FIRE BOARD INDUCTION DEC 2014 – The Oracle Fire Board inducted two members onto their board at their meeting on Dec. 2, 2014. Chuck Smallhouse replaced John Doran as his tenure was done and Bud Bristow was reelected – both for four-year terms. Shown below is the board for 2015. From left to right: Bill McMurry, Chuck Smallhouse, Bud Bristow and Manny Navarro, (missing is Ellie Brown). ORACLE FIRE BOARD INDUCTION DEC 2014 – The Oracle Fire Board inducted two members onto their board at their meeting on Dec. 2, 2014. Chuck Smallhouse replaced John Doran as his tenure was done and Bud Bristow was reelected – both for four-year terms. Shown below is the board for 2015. TREE WORKSHOP – On Saturday, May 16th, OFD and Oracle Firewise will be hosting another Tree Workshop and Firewise Education presentation. The event will be held at the Oracle Community Center. A breakfast will be served from 6:45am to 8:45am at the Community Center. The Workshop will begin at 9:00am and will wrap up by 1:00pm. FIRE IN ORACLE DURING STORM – During the thunder storm on the afternoon of Monday, May 4th, we responded to a lightning-caused fire near Oracle State Park. Accessing the location of the fire was a little difficult. When our firefighters were able to reach the fire they discovered that the rain had apparently stopped the flames from spreading. Damage was limited to one small area centered around a single smoldering tree that was quickly cut down and extinguished. The fire in itself was not unusual, however it is interesting to note how hot the fire burned during a fairly heavy rain event. If this same situation had occurred during a non-rain event, such as the "dry lightning" storms that often lead up to our monsoon; the outcome could have been a much different situation. ORACLE FIREFIGHTER OF THE YEAR – Our firefighter of the year for 2014 is Paul Farrell. Oracle Fire Chief Larry Southard said that Farrell has been with OFD for seven years. Farrell holds 35 certifications including one for hazardous materials from the National Fire Academy. He helped establish minimum company standards and training requirements for his shift, which, Southard said, has spread to other shifts as well. Farrell also set out and accomplished his goal of retaking his national certification as an EMT. Farrell was just recently promoted to the rank of captain. SMOKEY SAYS FIRE STATUS IS NOW AT HIGH!! BURN PERMITS HAVE BEEN SUSPENDED IN ORACLE. Please be careful out there; we recently had a small brush fire on Estill north of Grant that was caught quickly. There are three ways a spark can usually cause these brush fires: 1. from a thrown out cigarette 2. from sparks on a vehicle's dragging chain and 3. from a vehicle's hot catalytic converter contacting grass or other flammable ground source. Be aware – a single spark is all it takes! ORACLE SAILCART DEDICATION – OFD firemen were on hand Sunday, Jan 4th, 2015 to help dedicate the Oracle SailCart public sculpture made by Christopher Lucic located just west of the post office on American Ave. Christopher sends a big thank you to Captain McGovern and his crew. (photo by Rachel Opinsky). 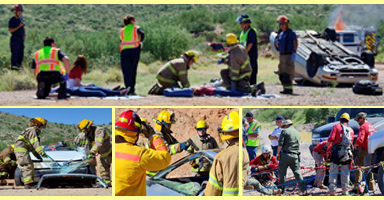 2015 WILDFIRE TRAINING EXERCISES – On Saturday, March 21, Oracle welcomed several Fire Depts., Red Cross, Pinal County Sherriff's office, and several government fire agencies (AZ State Forestry, US Forest Service, BLM) for training exercises most of the day at Mountain Vista School to be prepared for wildfires. Our own OFD Firewise Board and CERTs were assisting all day. The community visited Smokey Bear and learned about being firewise at the Firewise trailer located next to the Oracle Inn. Oracle’s Latest Homeowners’ Fuel Reduction Program– If you live in Oracle, own your home, live on one acre or more and are plagued by dense, fire-prone vegetation around your house, you may qualify for a new, cost-free, fuel reduction program being administered by the Oracle Fire Department and the Oracle Firewise Board. The purpose of this grant is to create a vital buffer perimeter around Oracle that may slow the progress of any future wild fires threatening the community. The focus will be on chipping dense brush, trimming trees and selectively cutting trees in an area limited to 200 feet around the residence. Stumps, bear grass or man-made materials will not be removed. Applications for the cost-free program are currently available at the fire dept. or by clicking HERE. Print this application and submit it to OFD. The applicant’s property will then be inspected and evaluated by a certified Oracle Firewise Assessor and submitted to a review committee for final consideration. Contact the fire dept directly or check the latest issue of the local paper for more information. 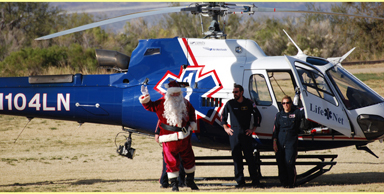 SANTA AT ORACLE FIRE STATION – Santa arrived by helicopter in Oracle and he made a brief stop at Mountain Vista School on Friday afternoon. After greeting several hundred children, he hopped aboard a fire engine and toured several neighborhoods, before arriving at the fire station at 4pm. Upon Santa's arrival, a line was forming that reached well into the parking lot. Santa visited with 137 children and he sent each of them away with a bag of goodies. OFD WEB COUNTER – (1/20/15) We have now had 100,000 hits on our website and we are stunned and amazed. Thank you all out there for making this possible. Let us know if we can improve the site for you in any way. ORACLE FIRE BOARD UPDATE – The Oracle Fire Board inducted two members onto their board at their Dec. 2, 2014 meeting. Chuck Smallhouse replaced John Doran as his tenure was done and Bud Bristow was reelected – both for four-year terms. Shown below is the present board. From left to right: Bill McMurry, Chuck Smallhouse, Bud Bristow and Manny Navarro; missing is Ellie Brown. Click HERE to see more information on the Fire Board. 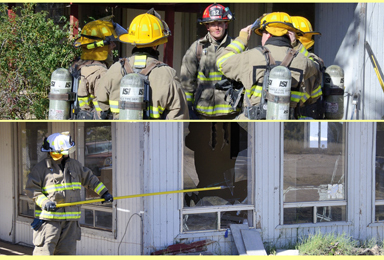 OFD EQUIPMENT FAMILIARIZATION & BREACHING DRILL – On Nov 15, 2014, OFD initiated a breaching drill at a double-wide trailer in Oracle. They rotated groups to cover all four areas of training while deconstructing the donated training structure. Eleven OFD firefighters attended as well as Mammoth Fire Dept and a number of CERTs and Explorers to assist. Captain Paul went over PPE (e.g. eye protection, gloves, safety zones, CERTS/rehab area). Click HERE if you would like to see more images of this drill. 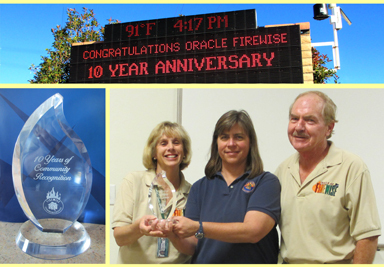 TEN-YEAR FIREWISE BOARD ANNIVERSARY – On Sept. 23, 2014 our own Oracle Firewise Board was recognized by the AZ State Forestry office for being an active and contributing board for ten years. Shown below is the award being presented by Carrie Dennett, Arizona State Fire Information, Prevention, and Mitigation Officer at Arizona State Forestry Division along with Firewise co-chairs Rachel Opinsky and Holt Bodinson. The award itself is an engraved crystal sculpture in the shape of a flame. It's a great testament to the men and women who have served over the years on the Firewise Board as well as to the professional staff of the Oracle Fire Department, our state and federal partners and most of all, to the involved and responsible property owners of Oracle. Congratulations! ORACLE FIRE BOARD CHANGES – John Doran is leaving the Oracle Fire Board as his tenure is done. We would like to thank John for his service to Oracle Fire Dept and the community. He is show here with a cake at a recent Fire Board meeting. He will be replaced by Chuck Smallhouse who will be inducted at the December 2014 Fire Board meeting. Interested in tracking the DEW POINT temperature? Click HERE for more information. 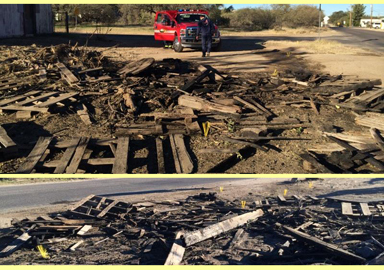 DEBRIS FIRE – A large "debris fire" late Wed. nite (11/26/14) at John Adams and Mount Lemmon Highway appears to have been intentionally set. The fire was quickly extinguished and the incident was turned over to the Pinal County Sheriff's Office. No structures were threatened and no injuries occurred. We are entering into an unusually early fire season this year. While we typically think of our fire season as being April through July; we are in fire season right now and we will likely remain in fire season until we get substantial precipitation. Please be extremely careful with all ignition sources and call 911 at the first sign of fire. OFD's NEW CAPTAIN – Tyler McGovern was "pinned" at Tuesday's Fire Board meeting as the newest Oracle Fire Captain (Shift A). Congratulations Tyler! He is shown here with his wife Michele getting his badge. NEW CAPTAIN – Engineer Paul Farrell has been promoted to the rank of Captain. Captain Farrell's wife Martha is shown pinning on his new badge. A large number of his family and friends attended the event that took place during the September Fire Board meeting. NEW CAPTAIN – On August 5, 2014, Albert Ortiz, Jr. was promoted to the rank of Captain. He is shown here with his fiance getting pinned at the monthly Fire Board meeting. 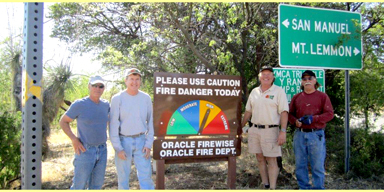 NEW FIRE STATUS SIGN IN ORACLE – The Oracle Firewise Board purchased a new sign to help alert the community and travelers alike, to current fire danger conditions. Oracle CERTs volunteered to install the new sign on property owned by long time Oracle citizens Frank Pierson and Mary Ellen Kazda (Kaz). The dial indicator on the sign will be changed whenever the Smokey Bear sign at the fire station is changed. BREATHING DEEPLY & SAFELY AFTER A FIRE – UA researchers are working to ensure that firefighters and first responders breathe safely while cleaning up after fires. Read the article from UA News by clicking HERE. INVISIBLE SNAKE BITES – Whether human desert dwellers are ready or not, Arizona's rattlesnakes are welcoming offspring. Baby rattlers are born in July and August and are active. The baby snakes have no rattle until they first shed their skins, so they make no warning sound before striking. The babies range in length from six to 12 inches, and have enough venom to be very dangerous. Brush and grass may camouflage the small snakes so well that they are "invisible" to people. The Arizona Poison and Drug Information Center in Tucson, part of the University of Arizona College of Pharmacy, serves all parts of the state. Specialists answering phones receive calls from Arizonans of all ages who have suffered rattlesnake bites without realizing they had encountered a reptile. For more information go HERE or contact Oracle Fire Dept. Homeowners' TREE Workshop & Firewise Education – Oracle Firewise teamed up with the Arizona Forestry Division to host a Tree Workshop on July 18th. About 50 people attended the 3 hour event. FAST FACTS ON EARTHQUAKES – Click HERE to read the facts on the NYTimes. Follow National Firewise Communities recommendations for making your home and property safer from wildfire. You can find lots of information on their website by clicking HERE. READY, SET, GO PLAN – This personal Wildfire Action Plan is invaluable for providing a lot of helpful tips on protecting your home and your family from wildfire and it also includes good checklists. Click HERE to read the pdf. It's that time of year when we all need to be on extreme alert for smoke and fire. Please call 911 at the first sighting, and please check out this document. SIGN UP FOR THE NEW ORACLE EMERGENCY NOTIFICATION SYSTEM – Click HERE to go to the "ONE CALL NOW" form. Please be sure to get any additional numbers in the system by filling out this form and returning it to Oracle Fire Dept. Oracle Fire and the Firewise Board are pleased to announce a new phone system ("One Call Now") that is the fastest way to get emergency information out to our community. This system has been funded by the Oracle FIREWISE Board and unlike our older system, it will deliver hundreds of emergency notifications at once to all phone numbers that are participating. • A three day supply of water- one gallon of water per person, per day; a first aid kit; and a flashlight with extra batteries. • Put extra supplies in an easy grab-bag like backpack in case an evacuation is ordered. • Avoid opening the refrigerator, this keeps the food from spoiling; if unopened it can safely keep food cold for about four hours. • Turn off the air conditioning. Power surges can damage it, resulting in costly repairs and a longer time without cool air during the hot summer months. • Do not to use candles. If the candles start a fire, there will be more than a power outage to worry about. FIREWISE PLANT AND TIPS FOR FIRE SEASON – (Tucson News Now) - Choosing what plants are around the exterior of the house could help keep everyone inside safe, especially with continued drought conditions in Southern Arizona and the wildfire season kicking off early. While all vegetation is at risk for burning, research now shows there are some plants that are fire resistant, which could make all the difference in a fire situation. How much water a plant holds is important when choosing which plants to put around the house, according to the Arizona Firewise Project. Project organizers are advising homeowners to keep in mind plants like pines, firs, junipers and Arizona cypress are flammable because of the oil they contain. For those who have a chance to pick up new plants for the landscape, authorities recommend plants that grow low and do not need to be pruned much. Also they advise choosing plants that are short and grow close to the ground like wild flowers. Click HERE to link to the Arizona'How to be Firewise' website and HERE see a full list of 'firewise' plants. 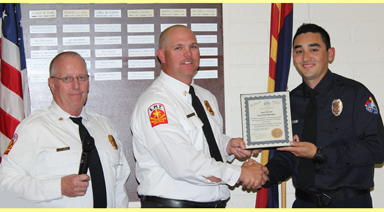 NEW CAPTAIN – Albert Ortiz, Jr. is shown here receiving his Captain badge during the July meeting of the Oracle Fire Board. Pinning Captain Ortiz is his girlfriend Michelle. Wildfire in Oracle on Thursday afternoon (6/12/14) . . . Excessive Heat Warning! – click HERE to read facts on dealing with how our bodies adjust to heat from Tucson News Now. NEW ASSISTANT FIRE CHIEF – Robert Jennings has been promoted to the position of Assistant Fire Chief. The official announcement was made during the April 1st Fire Board meeting when Chief Southard presented Robert with his badge and congratulated him on his promotion. Robert joined the fire department as a Junior Firefighter when he was a young teenager. Through many years of dedicated involvement, hard work and many classes, Robert has worked his way up through the ranks from an entry-level firefighter, to Lieutenant, Captain, Battalion Chief and now Assistant Fire Chief. Chief Southard commends Robert for his many years with the department and is looking forward to working with him in the years to come. WILDLAND FIREFIRE TRAINING – On Wed, March 19th, there was plenty of Wildland Firefighter crews from all over Arizona here in Oracle. 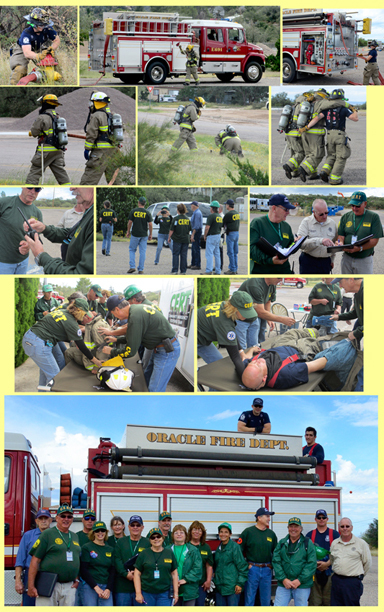 OFD and Oracle CERTs hosted a statewide wildland fire training event. Here's a few shots. Firefighters and engines from around the state arrived early at the staging area at Village Square. After an Incident Command briefing, four teams dispersed to pre-selected locations throughout Oracle. Each hour the teams rotated to other Skill Stations until they completed all training events. This is a very important event for our community, because it not only helps our firefighters further their wildland training and education, but the same out-of-area firefighters participating in this event, would be those responding to our community during a major wildfire. Hopefully we will never need the services of these other agencies, but if we do, it will be beneficial for them to know our area along with the types of fuels, topography, resources, staging areas etc. The answer to forest-destroying fires is more fire, researchers say – click HERE to read the article from azstarnet. Fire danger in Oracle has officials pushing for better protection for homes. An article on azstarnet features ORACLE photos in their news. Click HERE or on the photo below to see the gallery. Oracle Fire Chief Larry Southard has 1,700 homes to protect in his 33 square-mile district. And with continuing dry conditions and three unusually early brush fires battled this year, he is pushing hard to widen buffer zones from 30 feet to 100 feet between the oak/ manzanita forest and homes at risk. These properties in Oracle have been cleared to a point where they are less likely to be fire hazards. Photos by Ron Medvescek / Arizona Daily Star (Feb. 18, 2014). ORACLE TINDERBOX – Keeping one eye open! Another EXTENSIVE article on azstarnet has more details on the fire status here. In Oracle tinderbox, fire boss sleeps "with one eye open." Click HERE to read more. Weather Films tells the story of the Granite Mountain Hotshots and the Yarnell Hill fire. It also discusses the wildfire crisis seen in the United States in the last several years. Click above to see this 16-minute video from azstarnet. Read the full story: America Burning: The Yarnell Hill Fire Tragedy and the Nation's Wildfire Crisis. State Forestry Division hit with $559,000 fine for Yarnell fire action – read more at azstarnet. STUCK IN SNOW? Here's some interesting tips from CNN on what to do in case you're stuck in that long line of snowbound traffic. (Unlikely here these days!) Click HERE to read the story. Engine 692 has been released from the Aspen Fire in CA and is awaiting further orders. Once Resilient, Trees In The West Now More Vulnerable To Fire–check out this article HERE. ORACLE FIRE ACADEMY – Seven students from the 2013 Oracle Fire Academy have received their Firefighter I & II certificates. Our newest Arizona State Certified Firefighters are: Beau Houston, Gilbert Seballos, Harley Van Coillie, Jared Ortiz, Michael Parra, Rene Martinez and Spencer Fairbanks. Four of them are pictured here with Chief Larry Southard. Scientists call for more controlled burns in West's forests – Some of the West’s leading fire scientists are calling for the increased use of managed burns to reduce fuel levels in the region’s forests, warning that climate change is leaving them more vulnerable to large, high-severity wildfires. Click HERE to read more. RIM FIRE – The lessons learned from the summer of 1988 when fires burned nearly one third of Yellowstone National Park continue to shape the way we fight wildfires raging across the West today. Click HERE to see this 11-minute video from the NYTimes. SUMMER INSECT BITES – Here's link from Walgreen's on how to take care of and recognize those pesky critters. Click HERE to read this article. First responders are warning you to be extra careful if you're outdoors. Experts say traditionally, a lot of baby rattlesnakes are born in August as the weather starts to cool. Many people are spending time outdoors which leaves more opportunity for snake bites this time of year. If you see a rattlesnake inside your house, call 911. If you see one outside, take a step back, leave it alone or call OFD to remove it. If you decapitate it, it can still bite you and inject venom. Poison Control officials also say baby snakes are not considered more dangerous but they are still growing their rattle and don't always give off a warning. Adult rattlesnakes have a lot more venom to give you. INTO THE WILDFIRE – What science is learning about fire and how to live with it. "By supressing fires we're saving the landscape for the worst conditions,' a fire researcher says. 'We need to choose good fire over bad fire, and if we understand spread, we can make better choices." Click HERE to read this very informative article in the NYTimes. Brewer seeks reconsideration of Yarnell disaster aid. Click HERE to read more on this article from azstarnet. Click HERE to see photos of the Yarnell Fire. The Yosemite Inferno in the Context of Forest Policy, Ecology and Climate Change – from The New York Times. A variety of factors are driving wildfire trends in the American West. This opinion piece includes comments from the UA's Tom Swetnam and other experts on the topic. Swetnam specifically addresses human factors in the West's fire history and future. Click HERE to read more. RIM FIRE rages near Yosemite – UPDATE: Firefighters try to beat back flames as Yosemite fire grows. The Rim Fire, which has burned more than 192,000 acres, is 30% contained. The blaze has cost more than $39 million to date. Forest Service chief says firefighting will continue for weeks. Thunderstorms could complicate wind patterns, but lower weekend temps could help. Click HERE to see photos from the Rim Fire. WATCH OUT FOR "INVISIBLE SNAKES" – Experts on venomous creatures at the Arizona Poison and Drug Information Center advise gardeners, hikers, youngsters and other citizens to be especially cautious about baby rattlesnakes in the weeks ahead. The poison center urges anyone who feels a mysterious "sting," "pinch" or "bite" while outdoors, especially on an arm or a leg, to immediately call the center at 1-800-222-1222. Calling is a good idea for those who feel no pain but notice an unidentified small cut or wound, too. Click HERE to find out more on the topic. WILDLAND DRILL IN ORACLE – MARCH 26, 2013 . . .
OFD and Oracle CERTs hosted a statewide wildland fire training event. Firefighters and engines from around the state arrived early to the staging area at Village Square. After an Incident Command briefing, four teams dispersed to pre-selected locations throughout Oracle. Each hour the teams rotated to other Skills Stations until they completed all training events. This is a very important event for our community, because it not only helps our firefighters further their wildland training and education, but the same out-of-area firefighters participating in this event, would be those responding to our community during a major wildfire. Hopefully we will never need the services of these other agencies, but if we do, it will be beneficial for them to have gotten to know our area along with the types of fuels, topography, resources, staging areas etc. The Aspen Fire: Ten years later – Summerhaven and the surrounding area ten years after the Aspen Fire devastated the community in June, 2003. The fire burned 84,750 acres and destroyed 335 structures. Click HERE to see a photo gallery from azstarnet. Arizona wildfires: A look back– Special timeline article in AZstarnet today on some of the largest, most destructive or otherwise notable wildfires in recent Arizona history. Click HERE to check it out. • Make sure that fireworks are legal in your area before buying or using them. • Keep a bucket of water or garden hose readily accessible in case of fire or other mishap. • Soak fireworks in a bucket of water before throwing into the trash can. • Never try to relight or pick up fireworks that have not fully ignited. • Adult supervision is needed with fireworks. Sparklers, handheld fireworks, are a leading cause of injury for young children. • Light one firework at a time and immediately back away. For more firework safety tips visit the U.S. Consumer Product Safety Commission. Click HERE to go to their site for fireworks information. (July 2013) Statement from President Obama: "Yesterday, 19 firefighters were killed in the line of duty while fighting a wildfire outside Yarnell, Arizona. They were heroes -- highly-skilled professionals who, like so many across our country do every day, selflessly put themselves in harm's way to protect the lives and property of fellow citizens they would never meet. In recent days, hundreds of firefighters have battled extremely dangerous blazes across Arizona and the Southwest. The federal government is already assisting, and we will remain in close contact with state and local officials to provide the support they need. But today, Michelle and I join all Americans in sending our thoughts and prayers to the families of these brave firefighters and all whose lives have been upended by this terrible tragedy." WEATHER SPOTTER TRAINING AT OFD – On Monday, April 22, Ken Drozd from the National Weather Service (NWS) was on hand to teach a free class on becoming an official weather spotter for our area. Weather Spotters are critical on-the-ground volunteers that identify and report severe weather conditions to the National Oceanic and Atmospheric Administration (N.O.A.A). The class was sponsored by N.O.A.A. Storm spotters provide invaluable information to meteorologists by reporting severe weather conditions such as tornadoes, high winds and hail size which supplements data that can be used when issuing official severe weather warnings. Upon completion of the scheduled training, spotters are assigned an ID number to use when submitting reports by phone, ham radio or internet. Spotters support the mission of N.O.A.A. of climate monitoring and protecting life and property through accurate weather forecasts and warnings. 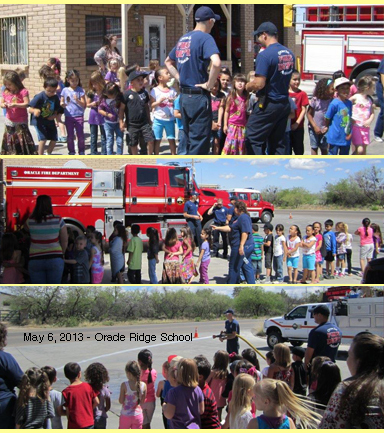 KID's VISIT OFD – On Monday, May 6, 2013 a kindergarten class from Oracle Ridge School visited the fire station. The 48 children were given a tour of the fire station, sat in a fire engine, watched a fireman spray water and put on his protective clothing. Brush Site – Signs are now posted directed at illegal dumpers that have been using our Brush Disposal Site for items not allowed. Please help us keep this site as it should be. The Site is open to residents of Oracle only. Items gladly accepted are: tree trimmings and brush. Items NOT accepted are cactus, garbage, lumber, stumps, paper, plastics, metal, fluids and site cleaning material. ARIZONA DUST STORMS – Most of the thick dust that blanketed Pima County three weeks ago with record-setting particle pollution probably traveled at least 300 miles from the Imperial Valley area of farm fields and deserts west of El Centro, Calif., a University of Arizona researcher says. Click HERE to look through the gallery from AZStarnet to view some of Arizona's past dust storms. Forest fire experts usually base part of their annual fire outlook on whether the dominant weather pattern is the so-called El Niño or the opposite La Niña. This year: "We're calling it 'La Nada,' " Spanish for "nothing. "That's because weather forecasters see no strong pattern of either El Niño or La Niña - terms that reflect whether sea-surface temperatures in the equatorial Pacific Ocean are warmer or cooler than normal. "So we don't know what we're getting in terms of the monsoon this year - the timing or how strong it will be." "The uncertainty of the monsoon – along with other factors–- results in an unpredictable fire outlook. That means we try to prepare for anything. Invasive grasses such as buffelgrass are an increasing problem. The invasives have changed the game for us – increasing the risk of fast-spreading fires. Summer temperatures also play a role in fire predictions and management. The temperature outlook leans toward hotter-than-normal temperatures for the July, August and September period. 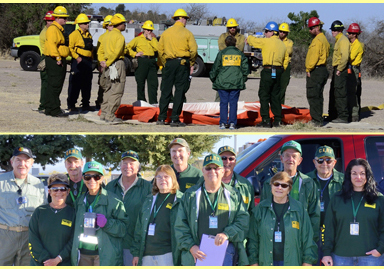 CERT DRILL – On Monday, Feb. 11th, OFD's CERT team got a real chance to try a more complex event than usual. Although it was a drill, most people were not aware of this and the call went out for them to report to the Fire Station for a multiple victim gunshot scenario call. They were told upon arrival that the shooter had been apprehended, the scene has been cleared by law enforcement for EMS Responders were to move in. The victims were the five firefighters that responded to the original call. CERTs were to be the first EMS responders to arrive on-scene. Some victims were wounded and some were deceased. CERTs were to TRIAGE all victims, treat wounds and package patients for ambulance transport, using equipment and supplies from the fire engine already on-scene. As CERTs arrived at the fire station, they were provided with the basic scenario were given the incident address. They were instructed NOT to use their two-way radios. From that point, they formed into teams and were on their own. A total of nine CERTs responded. Charleen Tipps – one of our CERTs and an active member of the Oracle Firewise Board passed away on April 28, 2013. "A Celebration of her Life" gathering was held at Oracle Fire Department on May 3, 2013 which her family and friends attended. AWARDS DINNER – On February 22 of this year, OFD had their 2012 Awards Dinner. Many people were recognized for their service to the fire dept. Among them, many of the staff that had been with OFD anywhere from five to 25 years of service. Firefighter of the year, Paul Farrell went home with many awards. Several CERTs and Firewise Board members were also recognized. Top photo shows Paul Farrell with Battalion Chief Robert Jennings and Fire Chief Larry Southard. Photos above show Brian Kirkpatrick, Kevin Armbrust, Rachel Opinsky, Doug Johnson and Karen Lombardi. Not shown is Mike Snyder, Kate Horton and Judy Sparkman. WOOD BURNING – EPA has a video that offers easy steps the public can take to help protect their health and save money when burning wood. This video provides steps on how to test dry wood for proper use in wood stoves or fireplaces. During the winter, residential wood smoke can be a significant source of fine particulate matter (PM2.5). The pollutant can trigger asthma, aggravate other lung diseases such as chronic obstructive pulmonary disease (COPD) and aggravate heart disease. Click HERE to see this 2-minute video recommended by Pinal County. This video can also be seen on the Pinal County Air Quality Burn web page. AMAZING CLOUD FORMATIONS OVER THE CATALINAS – Click HERE to see some of the best. I like THIS ONE in particular. Brought to you by the Atmospheric Sciences Dept at The University of Arizona - a selection of 'best of' cloud camera movies taken from the top of Gould Simpson on the UofA campus. Check their main website to see current weather - try the Radar link in particular. PAUL FARRELL. He was honored at the annual Appreciation Awards Dinner on Jan. 26th at the Elk's Lodge in San Manuel. For many years, the ceremony including a buffet dinner, has been hosted by the San Manual Elks Lodge as a way to pay respect to Firefighters, Law Enforcement and EMS personnel for the brave and courageous things they do, and to recognize the many accomplishments they make throughout the year. Paul's wife was in the audience to watch her husband receive this prestigious award, along with about 18 Oracle firefighters, Officers, CERTs and Fire Board members. 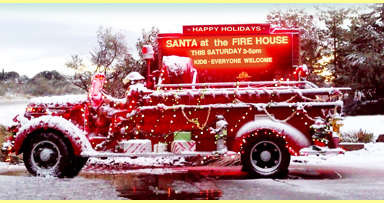 Happy Holidays 2012 – Here's the ol' fire truck that has been decorated in front of the fire house with a little snow recently! MT. Lemmon Photo Gallery – Check out some old and new photos of Mt. Lemmon from the AZStarnet website. It shows some of the fires we witnessed with the folks up there. Click HERE to see the photos. New OFD Trainees – We have some four new Trainee Firefighters that were welcomed into the department recently. They are Brandon Small, Beau Houston, Mario Brogdon and Gilbert Seballos. OFD Assists – June, 2012 - Oracle Fire E692 was on the Weber fire in Colorado and another in Wyoming, just two of many fires burning in the southwest. A few OFD firefighters provided structure protection to surrounding homes in the area. The photo below shows a burnout operation to try and save homes. Recreationists are reminded to WATCH FOR FLASH FLOODING during the current monsoon season. The area is beginning to experience more widely-distributed rains over the region. The potential for flash flooding will be high as the summer rains get underway, so be alert as you travel, especially in low or narrow canyon areas. Do not camp along the edges of streams, rivers, or dry arroyos. Watch for debris that can be dislodged by sudden flooding (rocks, slides, trees, etc). If necessary, wait for water levels to subside before crossing rising or swift waters. If you're not sure, wait it out! Water levels usually rise and then fall relatively quickly. Don't get trapped by rising waters. Please be advised to be cautious and aware if out in the forest near canyons and rivers during this type of weather. Oracle Brush Abatement Program – When it comes to grant funding, you can never have enough. Just ask the Oracle Fire Department . . . Ffunding has allowed it to extend and expand the brush abatement program. OFD has received grants totaling $121,400 from the AZ State Forestry Division that can be used for brush abatement around private homes. The funds allow a private homeowner living within a quarter mile of Federal land to receive a significant savings in the cost of clearing brush from their land by the AZ State Forestry Division and their AZ Department of Corrections Wild Land Fire Crew. Our ANNUAL BBQ at Oracle Fire House– Saturday, May 12th from 4-6pm. This year we are barbequing a steer! Donations will be accepted – and they will go this year to a NEW AED Recipient – Oracle Ridge School. They have been selected to receive an Automated External Defibrillator (AED) from Oracle Fire Dept. after training the staff to use it along with CPR training. This device makes the fifth device installed in Oracle by OFD. So far, there are AEDs in the Oracle Library, Community Center, Mtn. Vista School, Sierra Oaks, and now Oracle Ridge. For current weather conditions, please visit www.az511.gov or dial 511. HANTAVIRUS: Someone with ties to Oracle recently passed away from Hantavirus Pulmonary Syndrome caused by the Hantavirus. This is a somewhat rare disease caused by a group of viruses (Hantaviruses) that may be carried by some rodents. In North America, these rodents consist of the deer mouse, the white-footed mouse, the rice rat, and the cotton rat (not all, of which, carry the virus). To decrease risk of exposure, it is best to avoid all wild mice and rats and to safely clean up any rodent urine, droppings or nests in and around your home (especially in areas that have been closed for a long time.) To find out more information, read the article from the CDC's website by clicking HERE. Red Card Pack Test – Each year just before the wildfire season begins, wildland firefighters perform a Red Card Pack Test. The test involves wearing a 45-pound weight vest and making twelve laps around the school track in 45 minutes. This year we had 13 firefighters complete the test. Volunteers, including CERTs helped by timing and recording the event along with being a cheering squad. Click HERE or on the photo below to see more photos. CERT CLASS (Feb. 2012) – We recently graduated several people in a CERT class along with a refresher for former CERTs. Click HERE to see a pdf of the classes in action or on the photo below that shows the new CERTs. Oracle Fourth Graders Learn About Firefighting And Safety! Fourth graders at Mountain Vista School recently met some of the Oracle firefighters and members of the Oracle Firewise Board and CERT team. Click HERE to see more photos of the day. Firefighters talked to students about fire safety and showed them the safety equipment that they use such as the SCBA (self contained breathing apparatus). They gave them a demonstration of the tools that firefighters use for fighting fires which ranged from fire axes, shovels, and ladders to the "jaws of life." One fireman showed the kids the different ways firemen use the ladder in their work including how they sometimes slide down the ladder for a quick exit. The kids got to see the fire truck and were shown the gauges and controls for the pressure hoses. A fireman then climbed on top of the fire truck and demonstrated the fire cannon, shooting a stream of water into the air which created a rainbow. Bad Year for WIldfires? – (March 2012) Arizona Daily Star had an article on what we might expect this summer in regard to wildfires. Click HERE to read the article. 2011 OFD AWARDS – A number of awards were given out in December for outstanding service to Oracle Fire Dept. in 2011: Firefighter of the Year: Harley Van Coillie. Drills: #1: Lt. Albert Ortiz, Jr. #2: Harley Van Coillie #3: Dan Wilson. Outstanding Citizen of the Year: Rachel Opinsky Outstanding CERT Team of the Year: Susie Cochran & Judy Sparkman. Our condolences . . . Vivien Mayer – former CERT and supporter of Oracle Fire Dept. passed away on Jan. 23, 2012. "A Celebration of her Life" gathering was held at Oracle Fire Department on Jan. 26th with her family and many friends attending. Chimney fires are caused when debris, resin, creosote and other chemicals build up over time and then ignite when homeowners use their fireplaces for the first time. These fires are easily prevented by maintaining a clean chimney. Oracle Fire Department receives $24K grant to create community fuel break! This grant has allowed OFD to create a mile-long leg, 132-foot-wide fuel break that extends from Mt. Lemmon Rd. heading north past the transfer station. The area borders Oracle State Park and homes along Blazing Star Rd. It is part of an 18-mile long community fuel break. The area was previously covered with dense vegetation and trees which posed a severe fire hazard. “It was so thick, you couldn’t walk through it.” OFD working with the Arizona State Forestry Division and their Wildland Fire Crew from the Arizona Department of Corrections, were able to clear the vegetation and build the fuel break. THE AUTO-DIALER – Auto-Dialer Systems are similar to Reverse 911 systems in that they use a combination of database and GIS mapping technologies to deliver outbound notifications. Users can quickly target a precise geographic area and saturate it with thousands of calls per hour. The OFD Auto Dialer is up and running with several people trained to use it in case of emergency. The Auto-Dialer (reverse 911) could also be used for notifying people in case of evacuations. Do we have all your contact information? If you wish your cell phone number to be included in this list, stop by the station to sign up or find out more about it. You can also click HERE to print out the form to bring in. Dense Fog Tips – Avoid travel if possible. Drive very slowly with dipped headlights, full-beam lights reflect off the fog causing a ‘white wall’ effect. Keep an eye on your speed, fog can give the illusion of moving in slow motion. Use fog lights if you have them, but remember to turn them off when the visibility improves. Don’t hang on the tail lights of the car in front, rear lights can give a false sense of security. Watch out for freezing fog which is made of water droplets that freeze on contact with objects such as the pavement, road, car, etc. It can quickly form a layer of ice. Be aware that "black ice" may be on the road. THANKSGIVING COMMUNITY DINNER – Thanks to everyone that contributed and volunteered to the Thanksgiving dinner on Nov. 22nd sponsored by Oracle CERTs and Firewise Board. We could not have done it without this great effort by so many people. FYI: We cooked 13 turkeys and prepared seven hams. We estimate we fed approx. 450 people (a record)! There were 54 home deliveries (primarily home-bound individuals) and the remainder either dine-in or take-outs. SNAKES – Click HERE for some advice on rattlers that is very informative. KIDS MURAL – Mountain Health and Wellness held a ceremony on Sat., Nov. 19th to unveil a new mural done by a group of kids who donated their time and talent to paint on the back side of the old fire station on Mount Lemmon Hwy. We especially enjoy the fire engine and the cat rescue pictures. Pictured right to left are: Firefighter Tyler McGovern, Captain Robert Jennings, Firefighter Tina Acosta, Firefighter Brent Frost, Firefighter Jared Ortiz and Battalion Chief Larry Southard. Oracle CERTs attended a Safety Fair in Casa Grande on October 28th. Many public safety agencies were on hand to provide important safety information to the attendees. CERTs in the picture are getting ready to listen to Frank Duarte of Tucson Police Department. Duarte was the Incident Commander at the Jan. 8th shooting near Ina and Oracle Road. HIGHWAY 77 CLEANUP – The Oracle Firewise Board and CERT team with the help of some Explorers cleaned up Highway 77 between Mile Marker 101 and 102 for the third time on Saturday, Sept. 17th as part of the ADOT Adopt a Highway program. A sign is up for our part of the highway. Click HERE or on the photo below to see more images. Click HERE for the most recent Incident Command Center information on all Arizona wildfires. ARE YOU ON THE AUTO DIALER? Be sure the OFD numbers are not blocked in case you get a call. The phone numbers are listed with Qwest as Oracle Fire Department and Oracle Volunteer Fire Company. The actual phone numbers are 896-9385 and 896-2357. The auto-dialer toggles between the two numbers in order to make more calls in a shorter period of time. CERTs: The CERT team (Community Emergency Response Team) is trained in first aid, safety procedures, incident assistance, and other venues that help the fire dept. and the community in an emergency. They may help in the office or other non-hazardous tasks. Ongoing classes and training are held often. SCORPIONS – Many stings do not require special treatment but sometimes they require fast and expert medical care. 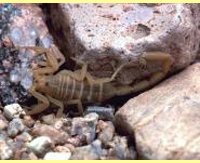 Click HERE or on the photo of the bark scorpion below to get more information. DUST STORMS – It seems to be happening more often. When a big wind blows across a dry desert, there is no way around a big dust storm, haboob, whatever you want to call it. News stories predict a hotter, drier, and dustier future for the "Southwest Dust Bowl." Click HERE to read more about this condition from the Arizona Daily Star. • If you see a dust storm in the road ahead, exit the interstate and wait for the storm to pass. • If you are caught in a dust storm, turn on your lights and slow down. Stopping on the roadway could hurt you and others. • If you decide to stop, pull completely off the road, turn your lights off and take your foot off the brake. • Have emergency items such as food and water in your car in case you are stranded a long time. 9/11 Memorial – Click HERE if you would like to see a photo gallery of the 9/11 memorial in New York that just opened to the public. Arizona fires in 2011 – (Sept. 5, 2011) Fires have burned more than 1 million acres of Arizona forest and grassland this year. They have burned in every month of the year, including this one. There are fires burning now in the Kaibab, Tonto and Apache-Sitgreaves forests, and in Grand Canyon National Park. There is even a small fire in the Rincon Mountains east of Tucson. "The thing about Arizona is we have fires year-round," said Cam Hunter, spokeswoman for the State Forestry division. Arizona fires reported to the Southwest Coordination Center as of Aug. 31 totaled 1,008,753 acres. That total does not include current fires, which range from 3 to 2,200 acres. All were lightning-caused and are being managed for "resource benefit," burning mostly along the ground and clearing out accumulations of dead wood, brush, leaves and pine needles. Monsoon moisture makes it possible to simply monitor the fires this time of year, rather than actively fight them. The real destruction came during Arizona's dry summer, and most of it hit the eastern and southeastern areas of the state. Wind pushed the 538,049-acre Wallow Fire across the Apache Forest on the eastern edge of the White Mountains and into New Mexico. The Horseshoe 2 Fire burned most of the Chiricahua Mountains in the state's southeast corner and the Monument Fire burned through the canyons of the Huachuca Mountains near Sierra Vista. All burned in areas listed throughout the summer as being in severe, extreme or exceptional drought - classifications that cover nearly all of neighboring NM, where 1,098,186 acres burned this year. Drought also created conditions for record fire seasons across the southern United States. In Texas, more than 3.5 million acres have burned and 14 large fires are currently being fought, according to the Texas Forest Service. Wallow Fire update – A Tucson man and his cousin have been charged with starting the Wallow Fire - the largest wildfire in state history. The Wallow Fire started May 29 and destroyed 32 homes, four commercial structures and 36 outbuildings. David Wayne Malboeuf, 24, of Tucson and Caleb Joshua Malboeuf, 26, of Benson, are each charged with causing timber to burn, leaving a fire unattended and unextinguished, leaving a fire without completely extinguishing it, causing and failing to maintain control of a fire and building a campfire without removing all flammable material from around the campfire adequate to prevent its escape. The cousins are scheduled to make an initial appearance in federal court in Flagstaff on September 19. It cost over $79 million to fight the Wallow Fire, which charred more than 538,000 acres in Arizona and part of Western New Mexico before it was contained. THANKS FOR THE BATTERIES – OFD recently received a number of AA and AAA Duracell batteries, thanks to a donation of the National Volunteer Fire Council and Duracell from their "Power to those Who Protect Us" battery donation program. Annual OFD Picnic – Saturday, Aug. 13th was the Annual Oracle Fire Dept. Picnic at Oracle Park. A good time was had by all with excellent weather, horseshoes, croquet, good food and even better company. Click HERE or on the photo below to see more pics. A walk through woods shows the need for more thinning, deliberate fires – Click HERE to read the full article. Fire strategy helped save 2 towns – The thinned swaths of forest that stood between two Arizona towns and the advancing Wallow Fire did not stop the blaze. The selective logging and clearing did, however, change the behavior of an inferno that was leaping treetop-to-treetop. Click HERE to read the full article. Interested in seeing photos from the Wallow Fire? Click HERE. Bravo! – 8/10/11 – We received a call for a rattlesnake removal. The lady in the chair sat down and unknowingly put her feet right on it. She felt the snake and it rattled, but did not strike. She slowly put her feet up and decided not to move while her friend called the fire department. Using two sets of snake tongs, our firefighters grabbed the snake and pulled it away from her. The snake was very angry and bit the tongs several times. She has to be the bravest lady in Arizona to be sitting there and smiling. Also the luckiest! WE GOT RAIN – and as a result, we were able to get rid of the HUGE piles of brush at the Brush Disposal Site. Click HERE to see a series of photos that showed what we did. FIGHTING WILDFIRES WITH COMPUTERS AND INTUITION: Check out the recent interesting article in The New York TImes on wildfires in Arizona. Click HERE to read the article. The Myths and Facts Of Fire - a 5-min. video from Arizona Illustrated (6/17/11) with Don Falk, an associate professor in the U A School of Natural Resources and the Environment, discusses fire ecology and restoration ecology. He has for decades focused his research on fire history, fire ecology and restoration ecology of the Southwest. Falk says extensive fires in the West have been part of the natural landscape for ages and play a vital role in those areas. Click HERE to watch this excellent video. HIGHWAY 77 CLEANUP – The Oracle Firewise Board and CERT team cleaned up Highway 77 between Mile Marker 101 and 102 for the second time on Saturday, April 30th as part of the ADOT Adopt a Highway program. A sign is up for our part of the highway. Click HERE to see some images of the event. EXTRICATION DRILL – OFD Fire, Oracle CERTs, and Explorers as well as Mammoth Fire, San Manuel Fire, Life Net 2, Native Air 17, and UPH joined together on April 10th for an Extrication Drill in San Manuel. The purpose of the drill was to build relations amongst the agencies and to learn new techniques in Extrication for new people just joining from the different agencies. VIDEOS and SLIDE SHOW can be seen by going to Copper Basin News. Thanks to John Hernandez of the Miner for taking these photos. Click HERE or on the photo below for information on the day and a 4-min. slide show! July 6, 2011 – CORONADO NATIONAL FOREST TO REOPEN SANTA CATALINA RANGER DISTRICT – Fire restrictions remain in effect, other Ranger Districts to open when fire danger is reduced. WANT TO GET THE LATEST INFORMATION ON WILDFIRES IN ARIZONA? Click HERE to get to the Arizona Interagency Wildfire Prevention and Information website home page. Check out Map of Large Wildfires in Arizona or Fire Weather & Outlooks. Check out LIVE WEBCAMS near Arizona wildfires – Click HERE to see Greer/ Springerville, Arizona. July 4, 2011 - 5:30pm – Access to Mount Lemmon will remain closed until 6 a.m. Tuesday. A fire was reported at about pm at highway post 21, at Spencer Canyon. It likely was caused by lightening, said Deputy Dawn Barkman, a Pima County Sheriff's Department spokeswoman. The blaze burned a tenth of an acre, but firefighters quickly contained it, Barkman said. The mountain is not being evacuated and firefighters are working to douse the fire, Barkman said. This is Arizona's biggest fire year in recorded history, with wildfires still burning and the fire season far from over. In figures updated Tuesday, the SW Incident Command Center pegged the burned acreage in Arizona at 757,076, or 1,183 square miles. The previous record of 761,959 acres, set in 2005, was certainly surpassed Tues, and Wed. with the enlargement of the Wallow, Horseshoe 2 and Monument fires. • The Wallow Fire, at 478,452 acres as of Tuesday night, is now the state's largest fire in history. • The Horseshoe 2 Fire, at 184,198 acres, is No. 3 on the list. • The Murphy Fire, at 68,078 acres, is eighth. In Southern Arizona, fire has burned through 303,076 acres of the Coronado National Forest so far this year, according to the center. For comparison, between 1988 and 2009, fires in the Coronado burned a combined 585,619 acres, according to the Coronado's Fire Management Plan. Northern Mexico is also experiencing its biggest fire season in at least 25 years. THE COPPER CREEK WILDFIRE (6/29/11) – This wildfire is burning in the Coronado National Forest east of Mammoth and has grown to 1,200 acres as of Wednesday morning (6/29/11), fire officials said. The fire sparked Tuesday in the Galiuro Mountains and is now 30 percent contained, said Jason Ownbey of the U.S. Forest Service. The steep rocky terrain is making it difficult for fire crews on the ground but aircraft support is keeping the fire down, Ownbey said. Crews have the fire under control and expect to have it fully contained by Friday, he said. The cause is under investigation. The fire poses no fire threat to Oracle. However, smoke may be present in Oracle especially during the evening and morning hours. HEART — Happy Equine Acres Rescue and Therapy — of Tucson is working with other local animal-rescue groups and authorities to ensure the safety of horses and other animals in Sierra Vista affected by the Monument Fire. National News: Wallow Fire near biggest in the state's history: click HERE to read the latest story and view photos. Click HERE for more photos on the Wallow Fire. Go HERE to see photos from the online Atlantic magazine. BY THE NUMBERS (6/16/11): This is Arizona's biggest fire year in recorded history, with wildfires still burning and the fire season far from over. In figures updated Tuesday, the SW Incident Command Center pegged the burned acreage in Arizona at 757,076, or 1,183 square miles. The previous record of 761,959 acres, set in 2005, was certainly surpassed Tues, and Wed. with the enlargement of the Wallow, Horseshoe 2 and Monument fires. • Building or using a fire, campfire, charcoal, coal, or wood stove fire, including within a developed, recreation site or improved site. Use of petroleum-fueled stoves, lanterns, or heating devices is allowed. • Smoking, except within an enclosed vehicle or building, a developed recreation site, or while stopped in an area at least 3 feet in diameter that is barren or cleared of all flammable material. • Using an explosive. • Operating an internal combustion engine except for motor vehicles. • Operating or using any internal or external combustion engine without a spark arresting device properly installed, maintained and in effective working order. • Welding. • Using a motor vehicle off national forest system roads. Parking in an area devoid of vegetation within 10 feet of the road, or parking in developed campgrounds and trailheads is allowed. • Discharging a firearm, except while in a lawful hunt. • Violating these restrictions can result in fines and/or prison time. COUNTY RABIES ADVISORY (3/29/11): Pinal County health officials have issued a rabies advisory after finding a third rabid skunk in the past six weeks. The warning comes after officials found a rabid skunk in Oracle last week. The other two skunks were found in Kearney and Mammoth. County officials are urging residents to have their pets vaccinated against the fatal disease. Rabies is an infectious disease that affects the brain and spinal cord of animals and humans, and is transmitted in the saliva of infected animals. County officials also warn residents to stay away from animals exhibiting unusual or aggressive behavior and call health officials. HIGHWAY 77 CLEANUP – The Oracle Firewise Board and CERT team cleaned up the highway between Mile Marker 101 and 102 for the first of four times on Saturday, Jan. 8th as part of the ADOT Adopt a Highway program. PACK TEST FOR OFD – Wildland firefighters are required to perform a Pack Test (endurance test) followed by a Wildland Refresher Class annually. These classes for all wildland certified personnel are usually held just before the spring wildland fire season begins. Click HERE or on the photo below to see the crew in action. AED DONATION – The Oracle Firewise Board has donated an Automated External Defibrillator (AED) to Mountain Vista School. An AED is a small portable computerized device used in conjunction with CPR to give an electric shock to a victim of Sudden Cardiac Arrest. If a shock is delivered promptly after collapse, many victims can survive without permanent brain damage. School office faculty have been trained on how to use the device that is mounted on a wall in the school nurses office. This is the fourth AED that has been placed in the community. Funding for these devices was provided by fund raising events including private donations. photo: Superintendent Todd Kissick, Principal Dennis Blauser, School Nurse Lydia Smith, School Board member Kurt Steffens, and Oracle Firewise Board members. ORACLE WILDFIRE INFORMATION VIDEO ON UTUBE – Check out Larry Southard and Frank Pierson's interview with Joe Pyritz of Pinal County. Click HERE to see the video. PRESCRIBED BURNS – like the one deliberately set Feb. 10th by the U.S. Forest Service, are protective. Click HERE or on the photo below to see an excellent article with photos from Arizona Daily Star on this 137-acre Kent Springs prescribed fire in Madera Canyon. ROPE RESCUE (new photos) – Several firefighters went to Vail again to practice rope rescue under a bridge. Click HERE or on the photo below to see new photos. YES, WE HAD SNOW – Click HERE to see a time lapse video of the snowfall and melt from Feb. 27th to the 28th, 2011. 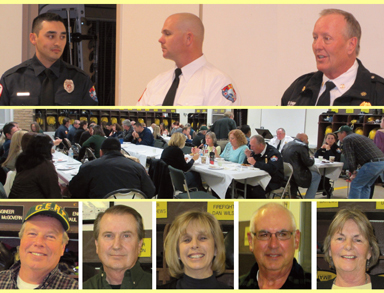 The Annual Firefighter of the Year Award Ceremony was held at the San Manual Elks Lodge on Saturday, February 26th. We congratulate Lt. Jeff Osborn as our 2010 Firefighter of the Year for Oracle. In addition, Charlotte Poole was named Citizen of the Year, and Kevin Armbrust & Collins Cochran as Outstanding CERT Team for 2010. Awards for drills and dept. activities were also given out. (Dec. 2010) Lt. Albert Ortiz, Jr., cert Kevin Armbrust, Tina Acosta, cert Charlotte Poole, cert Collins Cochran, Bat. Chief Larry Southard, Spencer Fairbanks, Chief Albert Ortiz, and Lt. Jeff Osborn. WINTER FIRE – Firefighters responded to a report of smoke near the Catholic Church at 4:05pm on Dec. 30th. Engine 692 crew gave an on-scene report of a fully involved shed fire located behind a historic residence at 35 Maplewood Street. Engines 691 and 693 also responded, including Battalion 691. Firefighter efforts were primarily focused on protecting nearby structures. The shed and contents were a total loss. No other property damages occurred and no injuries were reported. Click HERE or on the photo below to see more of these photos in our Gallery. CARBON MONOXIDE: a Winter Hazard – Indications of carbon monoxide in the home report headaches, nausea and confusion. Hyperbaric oxygen chambers are for treatment if people can get there in time. Such chambers allow patients to breathe pure oxygen inside a controlled environment. Safety information on carbon monoxide can be viewed by clicking HERE. JANUARY 2011 – OUR CONDOLENCES – We deeply regret the passing of OFD CERT Steve Hesley. We extend our heartfelt sympathies to his family and friends. Thank you to those that attended the celebration of Steve's life at the Oracle Fire Dept. on Sunday, Feb. 6th. Archive of Rainfall Information: Rain on 12/30/2010: 0.19" / Snow fall: 4.0" / OFD Rain so far in 2010: 21.15"
Past Year Totals: Oracle Precipitation: 2009 year total: 13.96"/ 2008 year total: 24.00"
Avg. annual precip. measured at Oracle residence from 2002 through 2009, inclusive is 18.49"
AND from Ross Hopkins: Total: 18.761" for 2010 / CY2009 annual rainfall = 13.962" / CY2010" = 18.761" Difference: + 4.799 (+34.37%) CY2009 Monsoon Season (6/15 thru' 9/30) = 6.403" CY2010" = 7.067" Difference: + 0.664" (+10.4%) 9-year (CY2002 thru' CY2010) average annual rainfall: 18.52"
ROOF EXERCISE – Firefighters and CERTs responded to an unscheduled training exercise which involved a simulated traumatic injury (broken femur bone) with a roof rescue. The four person on-duty crew along with five off-duty and reserve firefighters and seven CERTs responded to the exercise. Southwest Ambulance provided the dispatching services. These exercises are intended to refresh firefighter skills along with testing available resources. The exercise took place during the middle of the day and the middle of the week at a time when available responders are typically the least available. The on-duty crew and Southwest Ambulance Dispatch was informed of the exercise one hour ahead of time while the others had no advance notice. The response was extremely good and the the rescue went very well. The next unscheduled drill will be held during the spring of 2011 and will include a simulated structure fire involving forcible entry with victim search and rescue. BE SAFE THIS THANKSGIVING HOLIDAY! – Here are some tips from Arizona Daily Star on frying turkeys. Click HERE to see the pdf. FIRE PUMP TRAINING – Several members of OFD recently completed a 32-hour service training in "Fire Pump Operations & Hydraulics" which focused on formulas to calculate proper water pressure and quantity needed for various types of fires. Congratulations to: Tina Acosta, Paul Farrell, Brent Frost, Tyler McGovern, Albert Ortiz Jr., Brandon Small, Traci Southard, Harley Van Coillie & Dan Wilson. 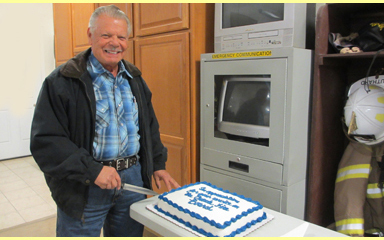 AUGUST 2010 – OUR CONDOLENCES – We deeply regret the passing of CERT and Firewise Board member Tom Wetzel. We extend our heartfelt sympathies to his family and friends. There was a celebration of Tom's life at the Fire Dept. on August 21, where more than 100 family and friends gathered to remember Tom. FIRST RESPONDERS – (June 2010) We had several CERTs graduate from their First Responder Class given at the OFD firehouse. This greatly expands the capabilities of the CERT team. Congratulations to: Kevin Armbrust, Judy Sparkman, Doug Johnson, Jason Weiss, Rachel Opinsky, Charlotte Poole, and Joyce McRae. HWY 77 FIRE – On June 25th at 2:18pm, nine firefighters responded to a report of a brush fire on Hwy 77 near MP 102. The fire was quickly extinguished and held to about one acre. A team of Oracle CERTs were deployed to assist. NEW FIRST RESPONDERS – We recently had several CERTs graduate from their First Responder Class given at the OFD firehouse. This greatly expands the capabilities of the CERT team. Congratulations to: Charlene Tipps, Kevin Armbrust, Tom Wetzel, Judy Sparkman, Doug Johnson, Jason Weiss, Rachel Opinsky, Charlotte Poole, Steve Hesley, and Joyce McRae. WILDLIFE: RABIES: The Pinal County Public Health Services District is urging Pinal County residents to have their animals vaccinated. SNAKES: Please pay attention and be safe. Click HERE for some helpful advice. BEES: If bees are swarming, they are usually protecting their queen and moving on to another location. Most attacks are caused when an established hive is disturbed. ORACLE MASTICATION PROJECT - Coronado National Forest has completed a fuels reduction project in the Oracle area. Click HERE for more details of the project. MASTICATION PROJECT: The contractor was on site Friday (4/16/10). The equipment was in excellent working condition; the masticator having just come from the FECON factory where it had received a new masticator head and fuel tank. The area already treated with the GPS is about 14.5 acres. The contractor said he had worked a total of 2 full days to accomplish that acreage. At 8 acres/ day, he will need approximately 20 full days to complete the 160 project acres. FIREWISE BOARD – The Oracle Firewise Board recently met on Feb. 20th and Chief Ortiz showed us the great banner presented to us from the National Firewise Board for our status in being "a recognized firewise community since 2005." We will be happy to display it at most of our functions. FIRE IN SAN MANUEL - At 1:27am on Wed. morning (3/31/2010), we were dispatched for a mutual aid assignment to assist the San Manuel FD on a commercial structure fire. We know that the Republic Plastics building in San Manuel has experienced heavy fire damage including some structure collapse. Oracle FD sent two engines and one water tender with a crew of 10 firefighters to assist. An Oracle CERT team was also deployed to provide drinking water for the fire crews. Click HERE or on the photo below to see some photos taken after the sun rose. ANNUAL ELKS AWARDS – On Saturday, March 20th, at the Annual Firefighters, Law-Enforcement, and EMS Appreciation Award Dinner at the Elks Lodge in San Manuel, Jason Weiss was awarded the "2009 Firefighter of the Year" award for the Oracle Fire Dept. ANNUAL 2009 OFD AWARDS – Several people were honored at our annual awards banquet for 2009: Jason Weiss was awarded "2009 Firefighter of the Year." Other awards included Charlotte Poole for "Outstanding Firewise Award"; and Doug Johnson and Rachel Opinsky for "Outstanding CERT TEAM award." 2009 NEIGHBORHOOD FIRE RISK EVALUATION - The 2009 Fire Risk Evaluation project has several intended uses including: 1. A measuring tool to view the progress of the Oracle Firewise program since the last Neighborhood Fire Risk Evaluation was done in 2004. (a paper version of the 2004 map can be viewed at the fire department). 2. To identify the highest risk neighborhoods for future fire prevention grant funding. 3. To identify high risk neighborhoods for future Firewise Workshops and community fire prevention projects. 4. To identify neighborhoods that need fire hydrants. Please note that this evaluation does not take the place of an individual on-site Firewise Communities Evaluation between the property owner(s) and fire department officials. An on-site evaluation has been completed for all addressed properties located within OFD boundaries. Properties were viewed from the street/driveway, graded by an OFD crew, and were then placed into three categories of wildfire risk. To see the 2009 Oracle map with evaluations CLICK HERE. RABID BOBCAT:The bobcat we reported on 12/24/09 was found dead Fri. morning on Cedar Ridge. The party that was bit is now undergoing rabies shots as the bobcat tested positive for rabies. Health officials say that 261 animals in Arizona (a record number) tested positive for rabies in 2009, 85 more than in 2008. THANKSGIVING DINNER (2009) –Thank you for making our dinner on Nov. 24th one of the best ever. We served about 250 people. Thanks to the approximately 70 volunteers who made it happen! PAVING THE PARKING LOT – (Sept. 22, 2009) Long overdue work on our parking lot has been done by local concrete contractor Daniel Rodriguez. He was awarded the bid to provide a concrete parking area in front of the fire station. The project is completed and ready for the engines to drive on. Come visit us to see the area. MOCK CAR CRASH at 10am on Oct. 8th. OFD participated in a mock car crash put on by the Pinal County Sheriffs Office (PCSO) and Mountain View School. This event took place at the school. The scenario involved an adult driver (Dennis Blauser school principal) and 3 teenage students. The audience was 4th-8th graders, so because of their ages, the script has been slightly modified to exclude the fatality, but featured 3 critically injured students. PCSO narrated the event on a PA system so that everybody was able to follow what was happening. Some of the CERTs assisted the event by tarping and un-tarping the staged accident vehicle, applying fake blood and other injuries (with Halloween stuff) assisting the students with staging, taking pictures etc. The students were extricated by OFD with the Jaws of Life tools, one student was loaded into an EMS helicopter, and two students were loaded into an ambulance. The driver was required to perform a field sobriety test and was then arrested. This was a really good safety demonstration about riding with an impaired driver. Stay tuned for some photos of the event. COMMUNITY FIREWISE EVALUATIONS – OFD crews have began a project of assessing the populated portions of our fire district. We have selected a National Firewise Communities assessment model, which uses a scoring system to rate properties in categories of Moderate, High, and Extreme. Numbered scores will be given for items such as topography, fuel loading, type of construction, egress, address markings, hydrants, etc. The higher the numbered score, the higher the wildfire risk will be for that property. Each category of risk has been given a specific color. Those colors will be applied to a digital map which will be posted on our web site at www.oraclefire.org Individual scoring results will not be posted on the web site but will be available at the fire station. The objective of this project is to identify our ongoing fire prevention priorities along with being able to provide valuable information to working fire crews in the event we ever have a large wildfire. For the next 4 or 5 weeks, our crews will be knocking on doors in hopes of finding someone home. If no one answers, crews will gather all of the information that they can visibly see between the structure and the street. Most property assessments will take approximately 5 to 20 minutes. The evaluations, including posting the maps on our web site is expected to be complete by October 2009. DODGE ROAD FIRE – (August 27, 2009) A faulty electrical transformer ignited four small grass fires along a 300-foot section of Dodge Road and Justice Drive. The fires were quickly extinguished with no other damage reported. Electrical power remained off in several sections of town while power company crews made necessary repairs. 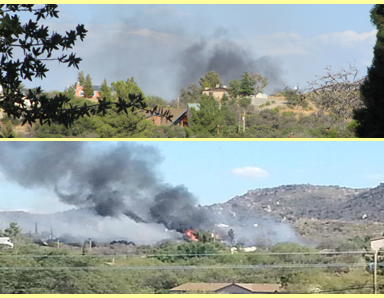 AUGUST 3, 2009 – A small brush fire near the Sonoran B&B on West Oracle Ranch Road was reported by a passerby. The call was dispatched at 1654 hours and the fire was extinguished several minutes later. The fire was contained at just under one quarter of an acre and did not reach the structure. The cause was an electrical malfunction on a power pole. AUGUST 5, 2009 – Engines 691 and 692 responded to a report of a structure fire. The small grass fire had just reached the shed when the engines arrived. It was quickly extinguished with only minor damage to the exterior paint. The apparent cause was a lightning strike. GUTHRIE FIRE in the Catalinas – (July 22, 2009) The fire north of Redington Pass and ne of Tucson has grown to 4,852 acres and was 30 percent contained Tuesday. The fire continues to be managed to benefit the landscape, said Salek Shafiqullah, CNF fire information officer. The fire was started by lightning July 11. CAVE RESCUE – (July 9, 2009) Oracle Fire Department Technical Rescue Team (TRT) rescued an 18 year old female who was trapped several hundred feet inside of Peppersauce Cave. The rescue took place at around 8 pm last night. The victim who was with her friends, was trapped for about an hour. Her friends unsuccessfully tried to free her from a muddy and rocky crevice after her leg became wedged into a small opening. After freeing the victim she was too tired to climb out of the cave on her own, so rescue crews had to use rigging to lift her up several steep areas. Once on flat ground, OFD firefighters took turns carrying her to safety. This was the first rescue operation performed by the recently formed OFD TRT. RECENT HIGHWAY 77 FIRE – at 11:33am on June 12, Oracle Fire Dept. responded to a brush/ grass fire at MP103.5 (just east of E. American Ave.) on Hwy 77. The 1/2 acre fire was quickly extinguished by crews on Engines 692 and 693. Oracle CERT's were also deployed to bring cold water to the firefighters. AED PLACEMENT IN ORACLE – We have one each AED unit now at the Oracle Community Center and the Oracle Masonic Lodge and there are plans to put one at the Oracle Public Library soon. OFD is working on a public safety project to place AEDs inside of public places, such as the library, courthouse, post office, community center and all three schools. Odyssey Health Care has teamed up with us and is trying to get several Tucson Cardiology Clinics to sponsor a unit. We will also be working with Northwest Hospital, Pinal County, and several businesses in an effort to get them to sponsor AED units. The fire department will offer free CPR/AED training to all those who work and/or volunteer at these places. OFD will also provide the periodic equipment maintenance.